Heat oil in heavy Dutch oven to 350 °C. In a bowl beat the egg, add beer, salt and hot sauce and mix. In bowl mix flour, corn starch and baking powder. Put flour mix into egg & beer mix and mix. Do not over mix, leave some lumps. 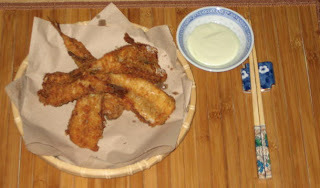 Dip cleaned smelts into batter, shake excess batter off and drop into bowl with Panko. Toss till evenly coated, remove to wire rack and repeat till all smelts are ready for fryer. When oil reaches 350 °C drop smelts in and move them around so that they don’t stick to each other. In about 3 – 4 minutes they should be nicely golden and crispy. Remove to rack lined with few layers of paper towel. Place on serving platter and serve with wasabi mayonnaise sauce. Mix wasabi paste and mayonnaise until well combined. Every recipe dealing with tempura recommends to make batter in small batches and ice cold. I made my in one large bowl about 1-1/2 hour ahead, coated the smelt and placed in fridge on a wire rack. They came out perfectly crisp and they were not oily at all. I lost only less then 1 teaspoon of oil frying 12 large smelts. Go figure. I guess some old rules can be broken after all. Second batch waiting for fryer. These smelts were sitting in fridge for 90 minutes, all coated, before hitting the oil.